No TV to watch the current game of the 2014 PBA Commissioner's Cup? Don't worry, TV5 brings free livestream channel to watch it online. AKsyonTV (AKTV) and TV5 in the recently concluded PBA Philippine Cup also have free livestreaming to promote and help its audience to catch up the game. Note: The video above is not copyrighted and can be shared on different social media platforms. PBA Update: After Rain or Shine’s win against Barangay Ginebra San Miguel on April 20, the Elasto Painters moved up to the No. 4 spot in the quarterfinals. 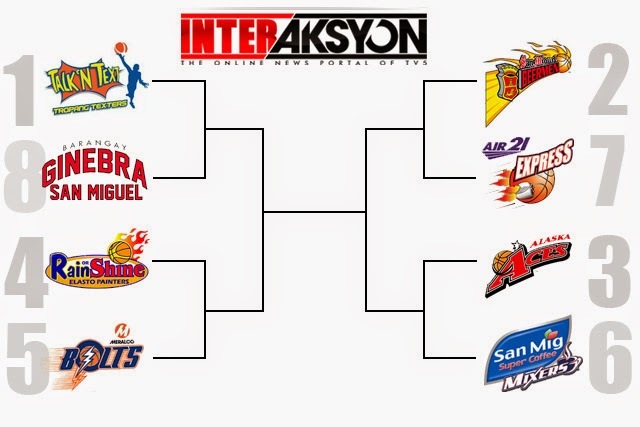 The playoff matchups consist of the following teams: Talk 'N Text Tropang Texters, Barangay Ginebra San Miguel, Rain or Shine Elasto Painters, Meralco Bolts, San Miguel Beermen, Air21 Express, Alaska Aces and San Mig Super Coffee Mixers. The 2014 Philippine Basketball Association (PBA) Commissioner's Cup, also known as the 2014 PLDT Home TVolution-PBA Commissioner's Cup, is the second conference of the 2013-2014 PBA season. The Commissioner's Cup started last March 5 and expected to be finished in May 2014. TV5 (formerly known as ABC 5) is a commercial television network based in Novaliches, Quezon City is an official licensee of the PBA. It is owned and operated by the ABC Development Corporation, solely owned by MediaQuest Holdings, Inc., a wholly owned subsidiary of the beneficial trust fund of the Philippine Long Distance Telephone (PLDT) Company headed by business tycoon Manuel V. Pangilinan.